I think we have a dozen different children’s books telling the story of Noah’s Ark sitting in my sons’ bookshelves. The story of Noah is such a familiar tale, and it is usually treated in this way: a self-contained narrative, plucked out of its home in Genesis and plunked into a children’s book. It has all the makings of an entertaining read to a toddler–boats, animals, a friendly bearded protagonist and lovely family, and it all ends with a rainbow. I believe Noah’s story has a lot more to tell us than simply that God saved all the giraffes and zebras on a big boat. In order to fully understand the events of Noah’s life, we are going to have to put that children’s book back into its original context: the book of Genesis. Moses inserted Noah’s story into the flow of his grand book of Beginnings for a purpose. Perhaps inserted is even too surgical; Moses has woven Noah’s narrative into the fabric of beginnings, longing for renewal, and anticipation of God’s promise which is the book of Genesis. Genesis 6 is only two chapters removed from man’s fall from innocence in the Garden of Eden, and yet how quickly man has fallen: “The LORD saw that the wickedness of man was great in the earth, and that every intention of the thoughts of his heart was only evil continually” (Gen. 6:5). Man has filled the earth with violence, sexual deviance, and sin. The creatures God created to multiply and fill the earth are filling the earth with chaos. And so, the Lord determines to “blot out man whom I have created from the face of the land, man and animals…for I am sorry that I have made them” (Gen. 6:7). God is going to begin with a clean slate. He is going to wipe the face of the earth clean like a freshly washed plate. It’s a do-over. But in the midst of this, Moses holds forth one man as a solitary hope in the midst of the chaos of sin: “But Noah found favor in the eyes of the LORD” (Gen. 6:8). God instructs this righteous and blameless Noah to build an ark. After he, his family, and the animals are safely inside this boat, God covers the entire face of the earth with water: “He blotted out every living thing that was on the face of the ground.” The chaos is complete. Man’s sin has brought death to all living, both man and animal, and the chaos from which God brought order has returned in judgment. In Genesis 1, the earth began as a globe covered with water: “The earth was formless and void, and darkness was over the face of the deep” (Gen. 1:2). In the flood, God has returned his created world to chaos. However, we have forgotten that floating above the chaos is our one hope: Noah. “But God remembered Noah…and God made a wind blow over the earth, and the waters subsided” (Gen. 8:1). This is the beginning of a re-Creation, a re-Genesis. Just as the Creation began with God’s Spirit (Hebrew ruach) hovering over the face of the waters ready to subdue the chaos and bring order, so now, God makes a wind (Hebrew ruach) to subdue the waters. Slowly the chaos recedes, and land begins to reappear, as it did in the Creation. Finally, the land dries, and Noah and his family and all the animals emerge into a fresh, new world. The author, Moses, gives us a sense of hope and anticipation. Noah, after all, was the “one [who] shall bring us relief from our work and from the painful toil of our hands” (Gen. 5:29). Surely he and his family can get their act together in this fresh re-Genesis. Surely Noah and his family will do better than Adam and Eve. God reissues the same blessing and command he gave to Adam and Eve: “Be fruitful and multiply and fill the earth” (Gen. 9:1). He even includes an extra command, pointing out that they shouldn’t murder one another (Gen. 9:6), so that no one falls into the trap of Cain’s vengeance again. Certainly this fixes the problem. Surely this new Creation, this re-Genesis, won’t head down the same path as the original. There is something foreboding about God’s evaluation of the situation. Even in the midst of blessing his re-Creation, he seems to think all is not well: “I will never again curse the ground because of man, for the intention of man’s heart is evil from his youth…” (Gen. 8:21). It doesn’t take long. We were so sure that Noah, a man blameless and righteous, would not be tainted by the effects of his grandparents’ sin. However, not three verses after the completion of God’s beautiful rainbow covenant, Noah and his family have fallen. Noah planted a vineyard, and “became drunk and lay uncovered in his tent. And Ham, the father of Canaan, saw the nakedness of his father and told his two brothers outside” (Gen. 9:21-22). The words are euphemistic, but it’s pretty clear that Ham has violated his father in some way. The very place we hoped to avoid is the place we have fallen into. Noah and his family have fallen right back into sin, and the nakedness that exposed the sin, guilt, and shame of their forefather Adam has come upon Noah. 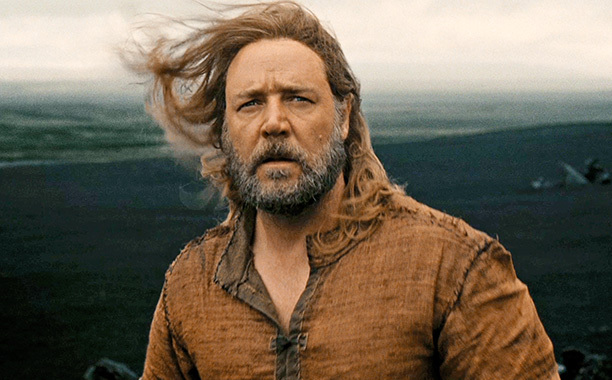 We had such high hopes for Noah. We thought he might be the one; he might be the one to crush the head of the serpent and defeat sin and death. He escaped the chaos of God’s judgment, but he and his offspring fell back into sin. God’s promise will not fail. Beginning in Genesis 3, the book becomes a constant anticipation and eager searching for the seed of the woman. Who will fulfill God’s promise and crush the head of the serpent? We though it might be Abel, but he was murdered. We hoped for Noah, but he experienced the guilt of sin. Our search begins again. Just like Genesis 3, Noah pronounces a curse on his sinful son Ham, but he blesses his righteous sons Shem and Japheth for covering over his nakedness–much in the same way God covered the sin and shame of Adam and Eve. In Noah’s blessing, we renew our hope and anticipation. Perhaps the offspring will come through Shem: “Blessed be the LORD, the God of Shem; and let Canaan be his servant.” After the Tower of Babel, Moses zooms in on one family: the descendants of Shem. In the line of Shem comes a man named Abram. Our suspicions were justified. God is still working to bring his promised offspring, and it will come through Shem. Any thoughts about the “curse on the ground” that Noah helped remove? Noah means rest or relief, and his father named him that because he said he would give relief from the curse on the ground. Yes! There is a delicious double entendre going on there. The first man is named “Adam” because he was made from the ground (Hebrew “Adamah”). So, when man fell in the Garden, naturally his curse came upon the ground (Hebrew “Adamah”). In the story of Cain and Abel, God mentions to Cain that his brother’s blood cries out to him from the ground. After Cain’s sin, God says, “And now you are cursed from the ground, which has opened its mouth to receive your brother’s blood from your hand” (Gen. 4:11). Adam brought a curse upon the ground, and Cain was cursed by the ground as it witnessed the terrible results of his sin. So, Lamech’s hope in Gen. 5:29, “Out of the ‘Adamah’ that the Lord has cursed, this one shall bring us relief from our work and from the painful toil of our hands,” is that Noah will roll back the results of Adam’s sin. And Noah did. Peace came to the earth through Noah. However, it was very short-lived. Ultimately, Lamech is looking for the offspring that will crush the head of the serpent, and he rightly identifies his own son Noah as the channel through which God will bring that offspring. Jesus Christ, our true rest from the curse of sin, came in the line of Noah. We also see in Noah a picture of Christ’s salvation through judgment. 1 Peter 3:18-22 explains how Noah was a picture of what God would ultimately do through Christ. He saves his people from the wrath of God, wipes the heavens and the earth clean, and establishes an eternal kingdom that will never again be tainted by sin. Interestingly, both the lines of Cain (Gen. 4) and of Seth (Gen. 5) end with men named Lamech. Cain’s Lamech brags about violence. Seth’s Lamech hopes for peace.